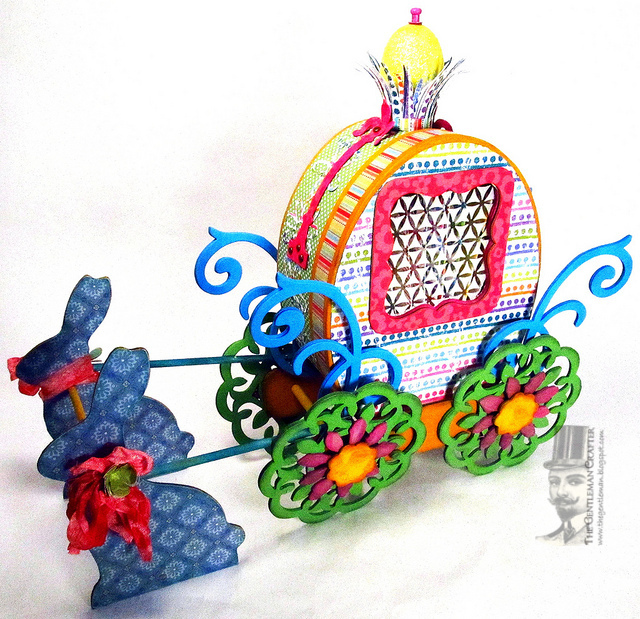 The Gentleman Crafter: Sizzix Storybook Easter Carriage- Done! Hope your weekend is off to a Wonderful start! Overcast this morning in Central Texas which means great crafting weather! Yahooo! 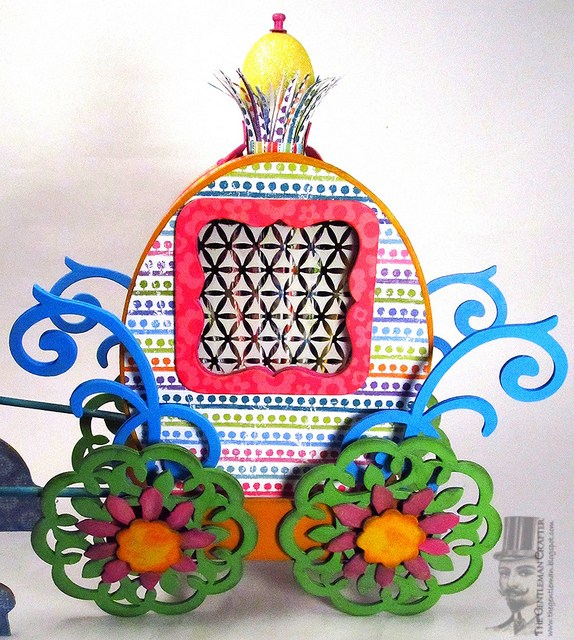 I give you Sizzix Storybook Easter Carriage.... A fun project using Sizzix Dies and a paper mache box from the craft store. I made a fast and easy tag mini to place inside the egg by making pockets, adding hinges in between and placing tags into the pockets. Done. 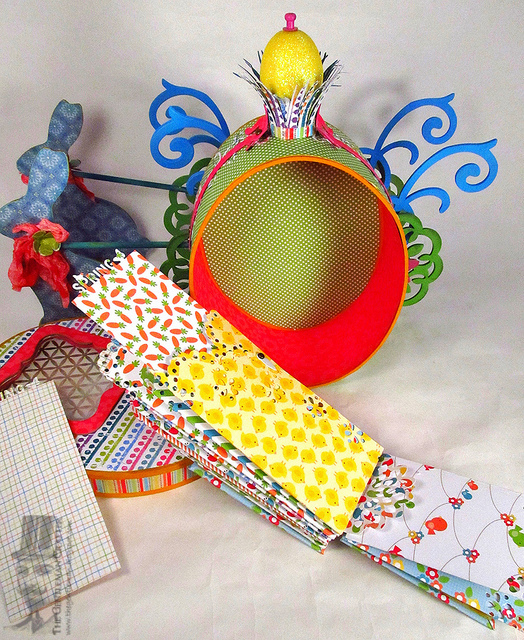 Thanks for coming by here and Sizzix Blog today! I appreciate y'all! How precious!!! Gotta have the tutorial... this will make a great project for my grandbaby!! You're the best Jim! 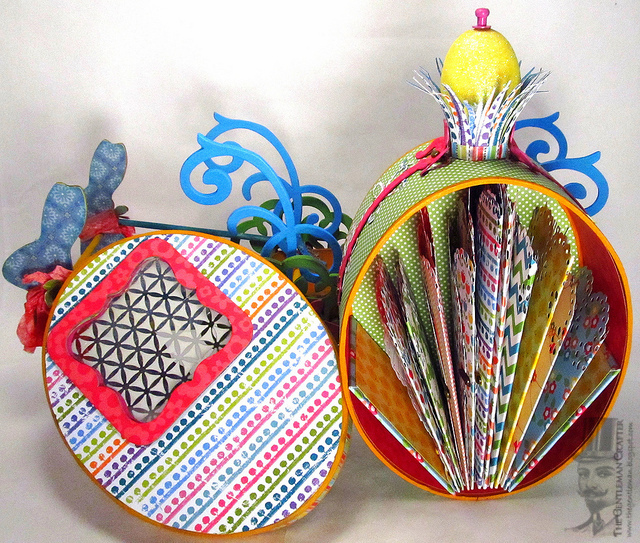 Sooo egg-cited to see the final project ... ;o) Just loved how it turned out! Left some love already on the sizzix blog. This is egg-amazing!!!! Wonderful project and definitely has your thumbprint, your so awesome Jim!! I remembered and it was the reason I jumped out of bed at 6 a.m.! I went there first and posted you a comment. It is so magical, it reminds me of something from Disney, which is my favorite magical place. It is so beautiful Jim. Job well done! OH JIM!!! The Easter carriage is soooooooo cute!!! I agree with LoriCtoo...looks like a Disney creation! As I said on the Sizzix post...it's EGG-squisite!!! And...thank you so much for taking the time to write up the tutorial, too!!! Oh Jim, It is beautiful. I disagree that it is Disney like, only coz I'm not a big Disney fan & I love your carriage! How does your brain go from dark & grungy to bright & cheery creations so quickly & get me wanting to recreate both for my own home? Fabulous. Going to grab the tutorial from the Sissiz blog & leave you some more love.. Hugs, Theresa. This is the cutest Easter decorative item. You inspire me to work in 3 d. Thank you for helping me grow in crafting. You do beautiful work. Wow Jim - what a lovely colourful creation! I like the mini inside - especially how it says "spring" on the top of one of the tags. I'm off to the Sizzix blog now to see if it says which die you used. WOW!!! Fantastic Jim, just fantastic! It's Cinderella meets Cadbury! I love it so!!! WOW,WOW,WOW, If this doesn't say spring. Jim you've done it again, this project is amazing. I'm on my way to check out the tutorial. I knew it was going to be eggy! I love the colors on this thing. Will be going over to get the "recipe" today! Have a good crafting day Jim. OMG = beautiful. Thanks for sharing! WOW Jim that is really cool You always make the Coolest stuff. Jim this is fantastic. Eggcellent work! Such a clever use of all the dies. Gave you some love over at Sizix too. Thanks for also including the tutorial. Have a great weekend. Jim... you are absolutely awesome! I love your project! I love it when you create and there are all these little secret compartments! You Rock! Hope you have a wonderful day crafting and rearranging! Will be cleaning up my craft room and finishing up some things that have been sitting for a while! Say "Hi" to Cesar!!! Just love this project! You are an inspiration, Jim!!!! Thanks for sharing!!! I just left you a message at the Sissix blog, but wanted to again say, You are an amazingly creative, wonderful person. Thanks for making the written instructions. i know this is time consuming, but you are so appreciated. Wow! What a wonderful thing you made! So colorful, so charming! Makes me want to get my Vagabond humming! Sir Jim...words are failing me now to tell you how amazingly creative you are! I am absolutely head over heals in love with this project and the colors are GORJUS!!!! You never cease to amaze me with your remarkable talent....I am so glad you are sharing it with us and also are now doing Ustream videos. Have a wonderful weekend. PS If you want my address so you can send this me, let me know.bahahahahahha! What a lovely project. You continue to amaze and bedazzle. Sounds like a circus project...hhhmmmm.... The instructions were so clear and the steps well photographed. The little mini inside was a great addition. So happy to see so many companies recognizing your extensive talents. What a feast for the eyes! I love how magical it feels. I'm starting a Gentleman Crafter collection, especially of modes of transportation.It's a wonderful world in which to find yourself. Extra thanks for making a tutorial.I know it eats up your time. This will definetly help me 'fall back' with daylight-saving time, adreaded occurance for a night owl. Way to go, Jim. Wowzer What a fabulous project Jim. I love it. 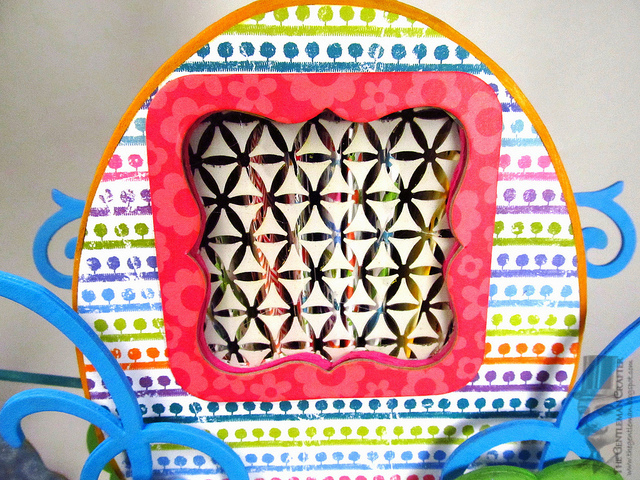 I will definitly be trying out this project for my daughter who loves Easter as well as paper crafting. Thank you for sharing your fantastic talent with us all. Also could somebody please let me know where I can get some hitch posts as I haven't been able to find them yet. Cinderella would be shamed by this carriage! Jim... I run out of words... What can I say that I haven't said?? You are sooooooooooooooooooooo creative... this carriage is too cute! My eyes hurt looking at the riot of color. Great idea but the color palette could have used more thought. Pastels work nicely for Easter and aren't nearly as painful to look at. As always, it looks fabulous, Jimbo! Thanks for sharing your talent & creations with us. Jim, this is beyond words! Incredibly precious. You never fail to amaze and delight! Oh My Goodness Jim, this is so cute! Your crafting range is so broad it's always a treat to stop by here! What a lovely Centerpiece! I'm heading over to Sizzix for the tutorial! LOVE it! You see so much in a simple paper mach box! Incredible! You just blow me away every time!!!!! Love your carriage! Thanks for sharing the tutorial..
btw...love the contemporary color palette! Wow, that is a carriage fit for Cinderella for sure. Love the book inside and the fun colors... The egg on top is a great touch. wow stunning creation , i feel its not manmade its from heaven. Wow! Wow! Wow, Jim!!!! How absolutely wonderful!!! I love the colors, the craftmanship, & the great tutorial!! So whimsical & lovely to look at. Thank u so much for sharing it w/ us! Just love your Easter cart. So glad I got to watch you make the book last Sunday. I raided Michael's this week to get one of those punches so I can try my hand at the book this week. thanks as always for sharing. So awesomely inspiring. Sir Jim, you and Lady Dy make my heart sing. 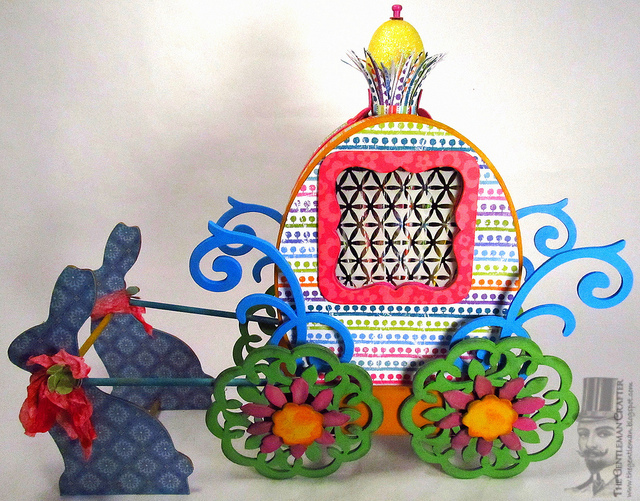 Love the Carriage--happy craftiness! Your attention to detail is amazing!! Love the shading on the swirls. Look forward to each thing you make.